The R.C.I.A. (Rite of Christian Initiation of Adults) is the restoration of the ancient practice of initiating adults (18 years of age and older) into the Catholic Christian community. Christian Initiation is concerned with the fundamental values of the Christian way of life, thus the R.C.I.A., is actually a sacramental process, not a program. It is a journey of intellectual, emotional, and spiritual conversion. Along the way, R.C.I.A. team mentors and presenters, nurture this conversion process of those individuals seeking membership into the Catholic Church through their support and encouragement. If you are thinking about coming back to church, if you have thought about completing the Sacraments you may have missed, or maybe you wish to learn more about your faith, why not give us a call. For further information call at 609-652-0008. The R.C.I.A. is actually one rite divided into four periods or stages. Baptized individuals, whether Catholic or another religion, seeking full reception into the Catholic Church. also journey through the Catechumenal process, although distinctions are made in the celebrations of the rites. How someone comes to consider joining the Catholic Church is unique to each individual. Years of marriage to a Catholic spouse, conversations with a Catholic friend or coworker, or even something written or viewed in the media can move an adult toward membership in the Catholic Church. Informally, this can go on for years! At some point, the person may contact a Catholic parish and begin to meet with other adults who are also inquiring about the Catholic faith. These adults, with members of the R.C.I.A. team, will take time to tell their own stories and connect them with the faith stories found in scripture. Some of the inquirers become firm in their desire for initiation and decide that they would like to begin more formal study of the teachings and practices of the Catholic Church. They are admitted into the next step through a special ceremony called the Rite of Acceptance into the Order of Catechumens. In this ritual the Church symbolically claims these men and women for Christ by signing them with the cross. This is the first time that the inquirers publicly declare their faith before the parish community. Because no one likes to do something like that on their own, each inquirer is accompanied by a sponsor. Sponsors may be chosen by the individual or provided by the parish. Sponsors provide support and companionship for the rest of the R.CIA. process. After this rite, the inquirers are called catechumens. This name indicates that they are learning the teachings of the Church and beginning to accept Catholic tradition and practices. Even though they are not yet permitted to receive the sacraments, the catechumens do enjoy other important rights. They have a right to assistance as they grow in faith by learning about the teachings of the Church and participating in works of service in the parish. They also have a right to be married in the Church and to receive Christian burial. The time spent as a catechumen will vary from person to person. The bishops of the United States have suggested that this catechumenate period is to last for at least one year. 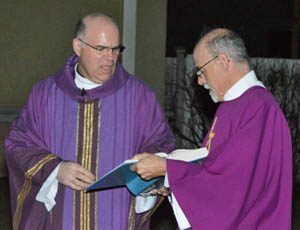 The period of the catechumenate ends when the catechumens discern, with the help of their sponsors and the parish R.C.I,A. team, that God is calling them to receive the sacraments of initiation (baptism, confirmation, and first Eucharist) at the next Easter Vigil. Before they can be initiated, they must be officially called to the sacraments by the bishop or someone designated by him. This Rite of Election is often celebrated on the First Sunday of Lent in the diocesan cathedral. The Rite of Election marks the end of formal study of the teachings and practices of the Church. The catechumens are now called the elect. The weeks of Lent are a time of intense prayer as the elect prepare themselves to celebrate the resurrection of the Lord at Easter and to receive the sacraments of initiation. On the Sundays of Lent, the elect are prayed for in a special way to help them prepare more fully for the sacraments. The sponsors continue to accompany the elect in church and support them in their Lenten preparations. On Holy Saturday, the parish assembles for the Easter Vigil. The Church has always recognized that in baptism we die to sin in Christ’s death so that we may rise to new life with him. The Easter Vigil is the primary celebration of the Lord’s resurrection and is, therefore, the most appropriate occasion for the elect to celebrate their baptism, confirmation, and first Eucharist. For the newly initiated, now called neophytes, the time between Easter and Pentecost is a special opportunity to reflect on the commitment which they have made to the Lord, to the Church, and to the local parish community. This time of unfolding the meaning of the initiation sacraments is called mystagogia. The Sunday scripture readings, which explain the meaning of the resurrection and of baptism, have special meaning for these new Catholics. During this season the bishop may gather the neophytes for a special Eucharistic celebration called the Mass of the Neophytes. The journey of faith lasts a lifetime. The weeks after Easter are a time for new Catholics to seek out their place in the parish community. Other parishioners can reach out to welcome them, helping them to get involved and feel at home.